At Holidaysafe we understand that independent customer reviews are extremely important when deciding whether to spend your hard earned money, especially on an important product like insurance. That is why we are proud of our 9/10 customer score on Trust Pilot, and the amazing feedback we receive from our customers every day. To say thank you to all our wonderful customers who take time out of their busy days to leave us their feedback, we add all of their names into our monthly prize draw, and pick one lucky winner at random to receive a £15 Amazon voucher. Once again I would just like to thank Mrs Finnimore for her lovely comments, and for taking the time to submit her feedback. We hope she enjoys spending her voucher, just in time for Christmas! 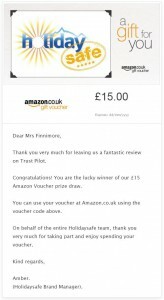 If you’re a Holidaysafe customer who would be interested in winning a £15 Amazon voucher, all you need to do is leave your honest feedback of our prices, services or products on our Trust Pilot Evaluation page. Once posted, your name will automatically be entered into our monthly prize draw and we could be contacting you next!